Take advantage of the best sailing New York has to offer at many outdoor facilities throughout the state. Enjoy everything from sailing lessons in NY to sailing tours in NY. The ultimate 3 hour vacation! 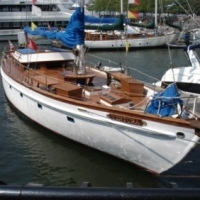 Charter a boat for a fun day in the New York Harbor. 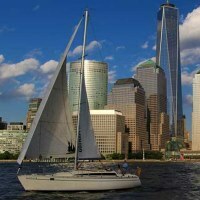 Sail NYC offers private sailboat and speedboat charter and rental for an active sail in the spectacular New York Harbor. You can participate as crew and hoist the sails or take the helm (drive) as you sail past the Statue of Liberty and Manhattan Skyline. Our Skippered boat charter includes a USCG Licensed Captain on board who will instruct you on the proper operation and safety so you and your crew will experience the thrill of sailing in the most exciting place on earth! 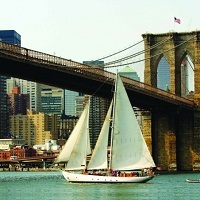 Sail the NY Waters as you Enjoy Great Food and Drinks! If you're planning a host a memorable summer event in NY or a fun event at any time of the year, Atlantic Sail & Charter is your premier destination! The environment is upscale, yet casual. The evening cocktail parties combine great food, drinks, low-key music, and 1920's big yacht sailing at affordable prices! 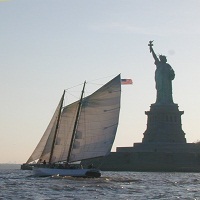 The NY sailing charters are great for entertaining clients. The dock is located at New York's World Financial Center, at the North Cove Marina. Atlantic Sail & Charter also offers seasonal dinner cruises off Fire Island, NY! Enjoy upscale, casual dining on the Great South Bay, while aboard a 1930's style double decker. See New York City from the Sea! If you are looking for something that will allow you to relax and escape from everyday activities, come to Classic Harbor Line in NY. Enjoy New York City's unique wonders by sailing on the three classic yachts - the Schooner Adirondack, the Schooner America 2.0 (sailboats), and the Luxury Yacht Manhattan (a motorized yacht). Enjoy warm hospitality and friendly service on any boat you choose. Spend memorable moments with your friends and family by choosing a private charter boat to celebrate your birthday or throw a bachelor party. At Classic Harbor Line you can also organize wedding ceremonies, bridal showers, and rehearsal dinners. Call now and book your tickets! Prices start from $42. If you are a resident or just passing through New York, don’t miss the chance to see it in a new way. Manhattan by Sail was founded back in 1972. By now, they developed a diverse little fleet of ships for anyone who wants to feel the thrill of sailing in the world’s greatest harbor. You can choose between two ships: the 82-foot schooner Shearwater and the 158-foot long Clipper City which is one of New York’s largest and most elegant sailing vessels. Whether you choose to sail by day, sunset or night, you will have one of the best sailing experiences in NY. You can organize a cocktail party, a music event or a wedding ceremony. Call or visit the web site to book your ticket.